ruthdelacruz | Travel and Lifestyle Blog : Contest Alert! Watch Team Azkals in Action: Join the Cortal SQR Facebook Promo! Contest Alert! Watch Team Azkals in Action: Join the Cortal SQR Facebook Promo! Who wants to see Team Azkals (yes, I mean Phil Younghusband) kicks the ball and let their opponent eat their own dust?! Cortal SQR, the official pain reliever of the team would bring this to you. Join the new Cortal SQR Facebook Contest to win exclusive tickets to the match between Sri Lanka and Team Azkals on July 3rd at the Rizal Memorial Stadium. 2. On the wall of Cortal SQR Facebook Page, from June 21 to June 28, post your most creative cheer for its newest ambassador, the Philippine Azkals for their game on July 3, 2011. Your post / cheer will serve as your official entry to the Facebook promo. 3. The post / cheer should end with “Sa Cortal SQR, We Believe, Kaya Nyo Yan!”. 4. Get as many Facebook friends as possible to like your post / cheer. 5. Five winners will be chosen based on their entries’ creativity and popularity (Facebook likes). Each winner will receive two tickets for the Azkals vs. Sri Lanka game on July 3, 2011 at the Rizal Memorial Stadium in Manila, Philippines. 6. Winners will be announced on June 29 through the Cortal SQR Facebook Page. Claiming of tickets is from June 30 to July 1, 2011. 7. This contest is open only to residents of Mega Manila (Metro Manila, Bulacan, Cavite, Rizal, Laguna) who are 18 years old and above. There are only a few entries at this point, so join now and cheer for the team! © ruthdelacruz | Travel and Lifestyle Blog : Contest Alert! 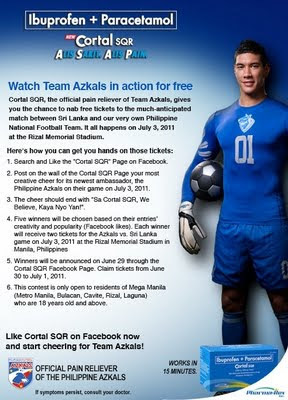 Watch Team Azkals in Action: Join the Cortal SQR Facebook Promo!